Paula Deen is a celebrity chef on the Food Network who makes mind-blowingly fatty food. I saw her deep fry a macaroni and cheese casserole with bacon in it. She is famous for a sandwich called a "heart attack" which is 2 glazed donuts, a hamburger, a fried egg, and bacon. OMG, she really did that! And then she ate it (and lots of similar stuff) and developed Type 2 diabetes. This story alone isn't that interesting until you hear what she did next. After three years of keeping her diabetes to herself, she has become a paid spokesperson for a diabetes drug from Novo Nordisc. She is making money because of her poor dietary choices. Wow, what a role model!! She is like a smoker who promotes cigarettes, who caught lung cancer, and is getting paid by her chemo company to hawk the drug cocktail. Goes down good, does it Paula? How about the side effects - should we talk about those? (actually she is also a smoker - but I'm not going to touch that). Now, I will stop being frustrated with her and show compassion. I want to like Paula Deen. Hey, I do LIKE Paula Deen, but when you get a wake-up call like Type 2 diabetes the party is over. Just think of the impact she could make if she had decided to change her lifestyle and adopt healthier eating habits. In three years maybe she could have lost 60 pounds and told us of her new love of kale chips. She would be a GREAT role model. Maybe she is too scared to change. I think her fans would love her whatever she does - but it would be hard to give up those signature dishes. So, if YOU have Type 2 diabetes (or your blood sugar levels are going up) - I am going to offer you another chef who actually is a role model. Mark Bittman tells us in his book "Food Matters" that at 57 years old he was overweight, his blood sugar and cholesterol levels were rising, and he had developed sleep apnea. And, what did he do? Go out and hawk a sleep apnea drug? No, he changed his diet (less meat more vegetables) and lost weight. He started eating a diet that was "vegan until six" and found that the weight just melted off of him. Then, he hawked TWO books (see below) - one about his transformation and another a cookbook to help the rest of us. If you haven't looked at these, you should. Mark Bittman is way too grumpy for the Food Network, which is too bad because we could all use his show. What do you think of the Paula Deen controversy? How Did Bill Clinton Lose All That Weight? In light of Paula Deen’s reaction to her type 2 diabetes, this is a great video to view. BTW, here’s great “smack-down” that Barbara Walters had with Paula Deen http://bit.ly/zYQwZh … make note of the date. THANK YOU....I shout from the top of the nearest mountain!!! I have been saying how 'scary' she is for a long time. The thought of her makes my arteries scream. First to find out 3 years ago....and then 'announcing' it becomes "breaking news" (altho better news to me would've been the temperature outside)....and then to let the world know that she's now a PAID spokesperson for a diabetic drug company!!! And her accent and laugh are completely fake as well....I live in TN (and have lived in other southern states) and have yet to come across anyone who sounds like her. She truly should be ashamed of herself, but obviously she's not. Thank you so much for putting this out there!!! I don't feel like Paula Deen had any obligation to disclose her own personal medical issue until she was ready to. I also don't have a problem with her being a paid spokeperson for a drug company; it's not like she's the first celebrity to do so. I don't think she cooked the way she did because she WANTED to develop diabetes. I think she cooked that way because that's what she knows, that's what she loves. There are a lot of chefs out there that are cooking unhealthy food, with a lot of fat and butter. I understand Paula goes really far with her foods, but the chances of people getting Type 2 diabetes because of Paula Deen are slim. It's mostly due to bad lifestyle choices. If you eat a Paula Deen recipe once a month, you're most likely going to be ok. Being diagnosed with diabetes is a very upsetting and can be overwhelming. That's why I don't blame her for not disclosing it. She may have needed time to get used to how to deal with taking care of herself. If Buddy from Cake Boss (or anyone from his overweight family) develops diabetes, do you think he'll stop making fattening cakes and pastries? Absolutely not. So why does Paula Deen get treated differently? Ok, going to have to be Melissa2, I guess! And apparently people named Melissa think the same! Funny! Dear Readers, It is 8 AM and things are already getting a bit heated. Please no insults or offending comments. I believe that we can have a great discussion here about celebrity obligations (or lack there of), lifestyle changes, diabetes, pharmaceuticals, etc. without slandering each other. Plenty of people disagree with me (and other commenters) every day on this site and do so respectfully. Agreed, and hope I wasn't offensive or insulting. My comment is still here, so I'm guessing it was the other person you are talking about. I love your column. Thanks for always providing great recipes and great thoughts for healthy living. I for one am a Paula fan. I love her food and her personality. I have been to one of her restaurants and the food is top of the line. Yes, I would be dead in a week if I ate there every day; however, it was a nice trip to go on. I have two of her cookbooks and make things from them; however, I also "trim" back on things and the food still tastes good. One of my favorites is her meatloaf with the oats and tomatoes in it. It is easy for us all to pass jugment on her but she is giving the people what they want. The one thing I noticed at her restaurant there was no shortage of people. She admitted that she does not eat the things she cooks every day and she doesn't think everyone else should either. We are given a free will to choose what we ant to eat, so while we're passing the blame on her, let's blame ourselves also for eating it. I had the opportunity to see her in person in Tunica, Misissippi in a noncooking show and she was hilarous. Very infectious personality. Love Paula's cooking and personality. I try to alter her dishes with less fat / meat substitute. I would welcome her publicly adjusting her classes dishes. She doesn't HAVE to, but it would be nice. Dear Snack Girl, Why so touchy? I didn't see anything in either of the Melissa's posts that was "heated", "slandering" or was not done so "respectfully." I, too, think your website is great but if you're going to allow people to comment, they should be able to comment without negative kickback. Just something for you to consider. Keep up your good work! just felt the need to say this. I've deepfried a cheesecake at work before (coated in 11 secret herbs and spices) and cannot see why anyone would do this. We just like to see how much someone has to be paid to eat it. As for why she would hock drugs as opposed to dietry change: money talks. Also agreeing with the Melissas and Sarah. In P.S., maybe the "way too grumpy for the Food Network" guy is that way because of his food choices? There is room for all types of foods, including Paula's. And she HAS changed her ways, letting everyone know that a good portion of her food is "Sunday" food or once-in-a-while food. It's important to remember. I'm sorry she developed Diabetes first but I'm glad she's making changes. Yes, Paula Deen makes fatty, salt-filled, cholesterol-packed food. But has anyone NOT made any of that? I mean, in our culture today, people enjoy eating these foods once in a while. I think that in a way, Paula Deen put the diabetes upon herself, eating certain foods with certain portion sizes, but that's her health to deal with. She doesn't need strangers telling her how to get rid of it. That's her doctor's job. I have to agree with the Melissas. In my experience growning up in the South, strong southern women of her generation have always kept personal family information close to the chest and showing your weakness is a journey. I think the bigger story is that an overweight America continues to blame others for their plight instead of taking accountability for themselves. The information to maintain a healthy lifestyle is out there (including Snack Girl) and no one is twisting our arms. Everything in moderation!
" a good portion of her food is "Sunday" food or once-in-a-while food". No, there is no need to ever deep fry a stand alone dessert, add chocolate and oil, sugar and sauces. Cheesecake is a sunday food. Deepfried cheesecake with chocolate is a never food. I think I may have watched her show a couple times and been simply horrified. I much prefer people who try to control their diabetes by diet and exercise, type 2 diabetes can actually be managed pretty well that way. Mind you, no one is going to give you a million dollar contract to promote that. I couldn't agree with you more! 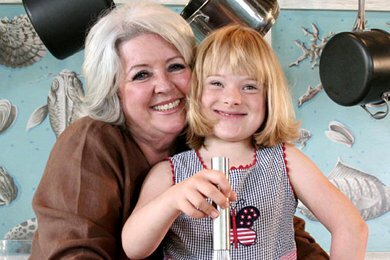 My 11 yr old daughter has Type 1 Diabetes, and this Paula Deen announcement has been fueling more misconceptions between these two very different chronic diseases. My daughter doesn't have a choice in wearing an insulin pump, etc. All of these people who develop Type 2 are not doing anyone favors by overloading our healthcare system with such an unnecessary illness. If my daughter's 'cure' could be lifestyle choices, she would have never been diagnosed 7 years ago in the first place. More and more children are being diagnosed with Type 2. Remember the 7 deadly sins...gluttony is one of them. I think Paula grew up making these recipes and she has made her fortune from them. Many famous chefs cook food that is heavy in salt and butter. She is not forcing anyone to eat like that every day. We all know what good choices are but now and then most people splurge a little. She does have recipes that don't contain a stick of butter in her cookbooks. I was diagnosed with Type II diabetes in my mid 50s & have eaten sensibly for years, exercised regularly, never smoked (which has zilch to do with diabetes anyway) and am not overweight nor have I been. As a nurse of almost 4 decades, I know that there is a big hereditary link that predisposes some people to diabetes. I don't think Paula Deen had any obligation whatsoever to disclose her health condition since it is a personal matter. People have developed this mindset that the public has a "right" to know every little private & personal detail about the life of a celebrity. I disagree. As for the supposed damage her TV show causes to others, I believe we all have freedom of choice about what we watch on our own TVs. Whoever doesn't agree with Paula Deen's cooking is free to change the channel. Just a reminder that not everyone with Type 2 diabetes is a glutton. My seemingly healthy brother in law-- a slender 58 year old runner with a decent diet-- was diagnosed with it last year. Likely a hereditary thing. The disease has developed a stigma by virtue of being associated with obesity, which is a shame. People should not be judged and stigmatized. We're all just trying to live our lives and do our best while on this planet, people.